At MWC 2015, Acer announced three new additions to its Z-series smartphone lineup. 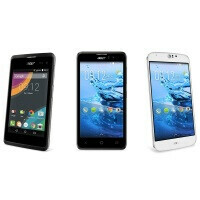 These are the new Liquid Z220 and Liquid Z520, a pair of entry-level handsets, while the Liquid Jade Z (not to be confused with the Acer Liquid Jade S we recently reviewed) is more of a mid-range offering. The Liquid Z220 (4-inch display) and Z520 (5-inch display) have WVGA (480x800) resolution screens. The Z220 is powered by a frugal Snapdragon 200 processor, while the Z520 runs on the Snapdragon 400 SoC. Both smartphones have 1GB of RAM, 2MP front cameras, and look essentially the same. However, the Z220 packs a 5MP rear camera, while the Z520 rocks an 8MP unit and DTS Studio Sound speakers. As for the Liquid Jade Z, this is an LTE-ready smartphone with a 5-inch 720x1280 screen, a 64-bit Mediatek processor, a 13MP main camera and a 5MP front-facing camera. The smaprthone sports a 7.9mm-thin body that weights just 110 grams. The display is of the Zero Air Gap kind, and fully covered in curved Gorilla Glass 3. This smartphone seems extremely similar to the Liquid Jade S, so if you want an early look at what it has to offer, read our review. The Liquid Z220 and Liquid Jade Z will be sold in Europe starting March, with prices reaching €89 for the former, and €199 for the latter. The Liquid Z520's launch will follow in April, priced at €109.